Diaper rash is a common problem among babies. Rashes can be irritating for the baby and can make things uncomfortable. Also, babies have a difficulty sleeping properly when they develop a diaper rash. But no need to stress if you remain prepared. By following our tips below, you will be more prepared if your baby ends up with diaper rash. If your baby wears a wet diaper for too long, it will develop a diaper rash. Your baby’s skin is quite sensitive and it can easily develop rashes and itches due to the moistness. The wet diaper helps in the growth of bacteria and other germs. Moreover, the constant moistness is harmful to the baby’s delicate skin. This issue arises when the baby sleeps with the wet diaper. It doesn’t realize that the diaper is wet and the diaper doesn’t get changed. Your baby might be playing a lot, as most babies do. Sometimes the baby develops a rash because of the constant rubbing between the skin and the diaper. In some cases, the wrong wiping technique could also be the cause of the rash. Be sure to use gentle techniques and avoid rubbing the area. A baby’s skin is quite soft and so you will need to use delicate cleansers to keep the rash at bay. The baby’s skin can easily get chafed due to the rubbing. Infections are another major cause of diaper rash among the little ones. The infection could be due to yeast or bacteria. However, these infections also arise because of the long wet times. If the rash is because of an infection, you will need to use the right ointments. Taking the help of a pediatrician will help you certainly in this regard. delicate skin dry, comfortable, and rash-free. Now that you know of the different causes of a diaper rash, you can easily avoid it in the future. The skin of your baby is quite delicate and so, you will need to remain extra cautious while taking care of the same. Treating the diaper rash is a very simple task. Most of the rashes tend to heal themselves in a few days. But if the problem persists then you will need to take the help of a specialist. It is a must if your baby has a diaper rash. Most of the times, the diaper rash occurs when the baby wears a wet diaper for too long. If you will keep changing the diaper often, the rash will begin to heal itself. It will not get the time to grow or develop into a major issue. If the baby has a diaper rash, then you will need to wash your hands properly before and after the diaper change. Washing the hands will remove the germs and when you will wash them after the diaper change; it will ensure that the germs don’t get transmitted elsewhere. You will need to remain alert and whenever the diaper gets soiled, get it changed. Try to pat the area gently to make it dry after cleaning. It is a basic mistake among new parents and caretakers. Don’t rub the area because the skin is too delicate for it. It will only worsen the rash and cause irritation. You should check the wipes to see if they are soft enough. Else, you can switch them to a different brand. The wipes should be plain and without any added chemicals, that means, avoid fragranced wipes. The chemicals could react with the baby’s skin. Your baby might be allergic to them and that will agitate the condition. So you should get plain wipes which don’t have any added substances. Ointments, creams and baby powder are effective against the diaper rash. You will need to clean the area dry before you apply any ointment or cream. Presence of Petroleum Jelly or Zinc Oxide will be helpful as they are effective in treating such rashes. Once you apply ointment or cream, put on the dry and clean diaper on the baby. Keep the baby powder away from the baby’s face. It can lead to a number of breathing problems as the powder can enter the nostrils. You can place the powder in your hand and apply it to the respective area. Remember not to use the steroid creams present in the market, unless prescribed by the doctor. They can damage your baby’s skin further. If you think that the diaper is uncomfortable or if it doesn’t last long, then you should consider switching it. An uncomfortable diaper can be a major cause for the diaper rash. Switch brands or sizes, whichever suits the baby the best. You can try switching the detergent if it seems reactive. These little steps can help you in treating the diaper rash quickly and get rid of the issue. In case the problem persists, you should consult a pediatrician. Development of crusty areas or pimples indicates an infection and in that case, you should contact the doctor. He or she will prescribe the appropriate medicines. My son started leaking through his diaper and pajamas twice nightly and we exhausted all disposable diaper options. We were at a standstill and quite frustrated getting up twice a night to change him and the bedding. We found Sposies as we were desperately searching for a solution. We insert two Sposies into his overnight diaper (one vertically and one horizontally near the top of his tush) and finally, FINALLY no leaks. If the diaper will be too tight then the baby will get uncomfortable. It will also prevent the air from flowing freely and thus, the diaper will not get dry easily. This will cause the growth of rashes. Let the air flow by keeping the diaper at a normal fit. Always wash your hands before changing the diaper. You don’t want any germs transferring onto the baby’s body through your hands. You should wash your hands later on too. Moistness can be quite harmful to the baby’s skin. It fuels the growth of germs so you should let the baby dry before putting on the diaper. If the baby remains in the birthday suit for a while, then that is not a problem. It will help in getting rid of all the moisture. Yes, it was mentioned before but after getting rid of the rash, it is important that you maintain this habit. When the baby will not have to face the wet diaper at all, the rash will not return. This way, your baby will remain happy and the rash will stay away. You may have noted that changing the diaper often is the most effective cure for the diaper rash. However, on a long drive or during the night, it is quite difficult (or nearly impossible) to check the diaper frequently. For such instances, you should use our Sposie Diaper Booster Pads. They are also known as the Diaper Doublers. With their help, you can enhance the absorbing capacity of the diapers so the diapers will last longer. Longer lasting diapers will stay dry and so your baby will get rid of the diaper rash. It is a good preventative measure too because wet diapers are the main cause of diaper rashes. The diaper rash makes it difficult for the baby to get a proper sleep. It irritates the skin continuously causing the baby to cry due to it. Our Sposie Diaper Doublers aid in curing the rash and so the baby can get a sound sleep without any worries. It enhances the absorption capacity of the diapers. This keeps the baby’s skin dry and free from the germs and moisture. Your baby’s skin will remain fresh and clean for longer periods and so it will have a better experience. This is a major benefit for parents too because you will not have to change the diapers often. You can take a few breaks and have some time to sleep or relax. Our Diaper Booster Pads are hypoallergic, which means they are free from any kind of allergic material. If the diaper rash was because of an allergy, it will get easily cured with the help of this product. We use cruelty-free materials and it is free from any harmful chemicals such as phthalates, fragrances and chlorine. We make them super soft so the baby gets a comfortable sleep without any difficulties. Some diaper rashes develop because of rubbing and chafing, the soft material of our Diaper Booster Pads ensures that it gets cured quickly. Your baby will be in safe hands. Both pediatricians and dermatologists have tested our material so you can rest assured that your baby will be using a safe product. The sizes are according to the babies’ sizes so there will be no problem with the fitting. Our packs only cost $10 so you will not have to spend much as well. Our Diaper Booster Pads are readily available at the leading stores including Amazon and Target. So you can get them easily and cure your baby’s diaper rash. Diaper rashes are a major issue but with the help of the above tips, you will get it treated. The treatment of diaper rashes is not much difficult too. Your task will get simpler when you will take the help of our Sposie Diaper Booster Pads. 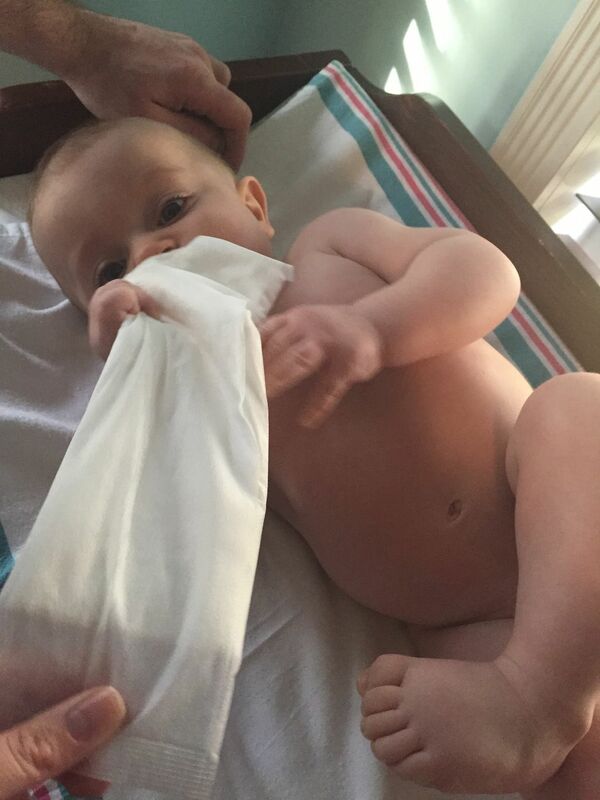 How did you treat your baby’s diaper rash? Feel free to share your experience with us. If you liked the tips, share it with your fellow couples who have a new-born. It might help them out.